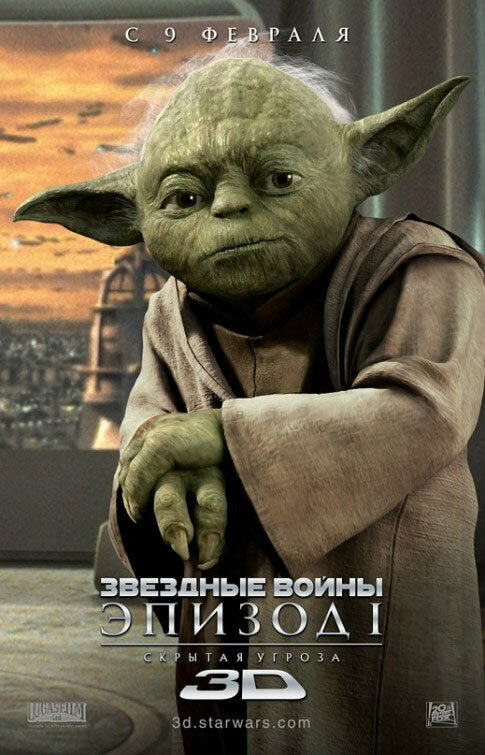 Guess Maul won’t be headlining all the promotional materials for The Phantom Menace 3-D… A Russian poster features the CGI version of Yoda. Click on the thumbnail at right to see the full poster. It’s no surprise that the CGI version will be featured, since the subpar Phantom Menace puppet version was entirely replaced on the Blu-ray version of the film, but it’s an interesting bit of trivia nonetheless. I have no idea why everyone thinks the TPM Yoda puppet was poorly made. I thought it worked excellently and was one of the only strong visual links to the OT (along with R2 and 3P0.) I really wish they could have figured out a way to keep the puppet in all three prequel films. Jackson proved in LOTR that practical effects and CG can go hand in hand. I wish Lucas had followed his example. Oh well. The CG Yoda isn’t bad, I just like real Yoda more. The original TPM puppet was just ‘off.’ It looked like Yoda, but something just wasn’t right. In general, I am all for puppets and Muppets and everything in-between – I think it often helps when these things are ‘real,’ and CGI still isn’t perfect. But in this specific case, I think it’s a definite improvement. CGI Yoda isn’t going to fool me into thinking it’s the original puppet, but it’s better than the TPM one. After watching the films on Blu-ray, I actually prefer the CGI Yodas over the puppets. I wouldn’t want the puppet changed because the work they did in Empire is pretty great. The work done in Jedi, not so much, comparatively speaking. This poster seems to be rendered close to the Cup Noodles ad we saw a few weeks ago. I think it looks kind of cheap. Could somebody please give this Yoda poster a hug? He seems in desperate need of one, having this Puss in Boots type look. He knows Episode II is coming up next. :ba dump dump: Thank you. I’ll be here all week.